Anna and her grandson are eager to see Hillary elected as our 45th President! Photo by Kristen Blush. Kristen Blush: What was it about the 2016 Democratic Primary that had you feeling the most empowered to vote for Hillary? Anna: I was thrilled to be able to vote in the primary for an incredibly competent, intelligent, experienced candidate with a wide range of ideas that made a lot of sense to me. It’s kind of like she has thought of everything! Hillary has an openness to addressing tough issues that is refreshing and very much needed. It was definitely a bonus that I got to vote for a tough, inspired woman. I live in a state that tends towards conservatism and it was great to be able to cast my vote for a practical, progressive candidate. KB: If you could say one thing to all female millennial's what would you say? Anna: It’s hard to convey to millennials that it is a luxury, built on the backs of women who came before them, that they are able to feel that they are not discriminated against. My mother shared stories of being unable to obtain a credit card without her husband’s permission. I remember speaking up for my 9-year- old daughter, now 33, when I overheard her playground coach claiming that “they loaded me up with girls,” as he attempted to excuse his poor coaching. Subtle messages, spoken and unspoken, are as toxic now as they were then. Electing Hillary will go a long way to equalizing the playing field for everyone. KB: For your grandchildren, what are some of the most important issues that helped you determine who would get your vote? 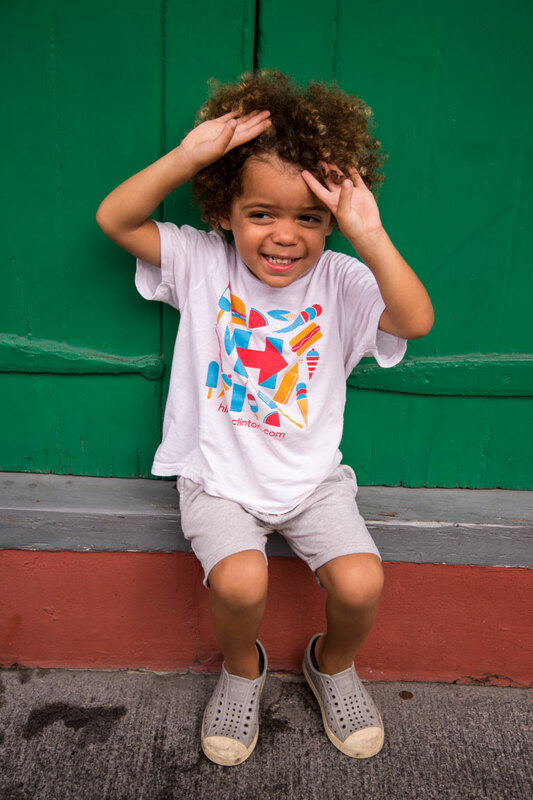 Anna: My grandson is a beautiful biracial preschooler. Hillary’s willingness to name and fight against institutional racism is so important to me as I become even more aware of the privilege that accrues to me just because I am white, not because I earned it. We have to address mass incarceration, understanding its roots in the centuries-old (and way to current) criminalization of blackness. We have to take steps to make this a better world for my grandson and all Americans. KB: Is there a Hillary Voter presence in NOLA? 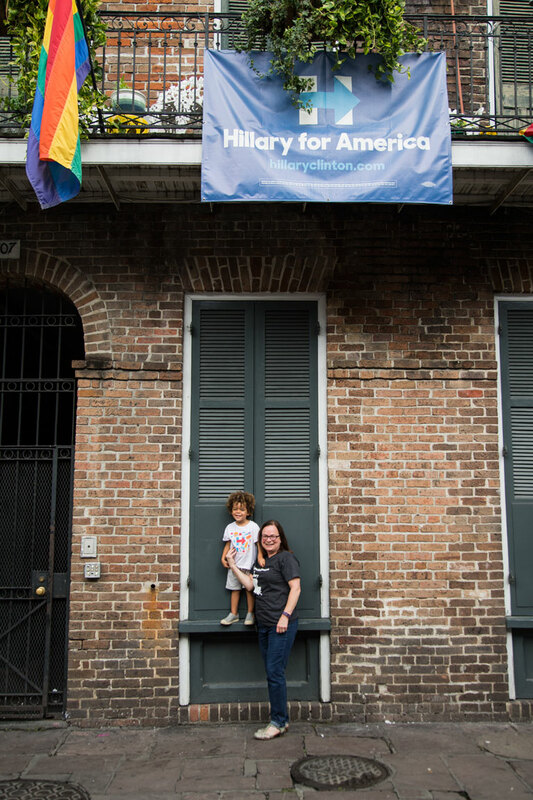 Anna: There is a strong Hillary presence in New Orleans although the state overall seems more likely to go for Trump. That’s why it’s more important than ever to work hard to get the word out to elect Hillary. KB: Do you have a unique Hillary story of your own? Anna: In 1992, Hillary Clinton came to New Orleans in support of Bill Clinton, then running for president. She spoke outside the Louisiana Superdome to a fairly small but very enthusiastic crowd. My 8-year- old daughter was wearing her “Hate is not a Family Value” shirt. We stood towards the front and Hillary remarked on my daughter’s shirt, saying how important it was to remember that we’re fighting to improve the lives of all Americans. Even then it was clear that Love trumps Hate! Kristen Blush is a Freelance Photographer based in New York City with over 15 years of experience. Her background in Photojournalism influenced her work with the Babes For Hillary and HRC Brigade. Her professional portfolio includes a "Hillary Clinton & Activism" gallery that may be viewed here. HILLARY RECEIVED HER COPY OF THE REVOLUTION IS FEMALE! Oct 12 Planned Parenthood Turns 100! Oct 28 A Q&A With Babes For Hillary!